Hello and welcome to a Wednesday here at the Prepatorium, where we share an item we think will provide a modicum of entertainment. A prestigious NYC production company is planning to shoot a reality TV show about The Hamptons this summer. We are partnering with a major television network to bring the fun, drama, and ups and down of summer in the Hamptons to a national audience. We are assembling a diverse group of people who are from the area or who will be spending the summer in The Hamptons. The Curbed story is illustrated with a great graphic. The shoot is planned from July 1 to Aug. 31. East Hampton Town Clerk Fred Overton said no one has applied for a film permit yet, but they have until seven days before the first day of shooting to do so. If the shoot is taking place exclusively on private property, a permit will not be required. Do you like to have fun, enjoy the limelight, have goals…. like starting a business or engaging in a new job, winning a surf competition… like to party, know the scene, are new to the scene, have boyfriend/ girlfriend problems, work hard to be able to afford a great lifestyle, don’t work at all because Daddy pays for everything, or just simply has a lot of charisma and want a shot at being on TV? Then be in touch! This is NOT Jersey Shore. It’s classier, smarter. It’s The Hamptons, after all. Age range 21 – 30. Do you have loads of personality and love to gossip? Do you think some of the people you work for are ridiculous in how they treat their family or run their house? Are you good at what you do and not afraid to talk back to your boss? Naturally all of the employees participating in this show will be able to keep their jobs, regardless of what they say about their employers. Really. Big Frame Productions is doing an open call looking for strippers ages 18 – 28 for make-over show. Looking to upgrade their life. If you and your significant other have acting experience, that is a plus. Your relationship doesn’t have to be in major trouble. You just have to have the ability to play up the issues you do have. Nothing says reality like professional actors. You find so many unexplored topics on these reality casting sites, why has no one focused on this theme before? Will you or anyone you know stop at nothing to meet pro athletes, and date them? Is it a weekly thing to go bars and events to meet athletes? If that doesn’t ring your bells, the one for “Grossest Person in America” is arguably the most revolting thing we’ve read this week. Do they cough or sneeze and not cover themselves? Do they refuse to do laundry, clean the bathroom, or clean up after themselves? Are they Rude? Crude? Or just plain Gross? Are you an outdoorsy chick who is also a major girly girl? Do you wear stilettos and drive an ATV? Do you and your friends hunt all day and party all night? A major television production company is looking for a group of friends to follow in a brand new TV show. If you throw epic parties, always have boy drama and know your way around the woods then we want to hear from you! We are looking for those girls that everyone knows and everyone wants to be. Let’s show the world how real Midwesterners party! What do you think, should I apply? (I know you all harbor an image of your trusty scribe careening around in an ATV, hunting all day and then partying all night. Admit it, that’s what you think.) Heh, heh, heh. We leave you with a little something to make you smile, a few of the images that have popped up showcasing The Leg. Until next time, may your reality be fabulous. Happy Friday everyone, it is delightful to be contemplating a weekend after only four ‘office days,’ no? We share more Friday Fun today, beginning with some updates for anyone planning a little playtime in the Hamptons this summer. There are many additions to the retail landscape, with several stores recently opening or about to open, including Crewcuts by J. Crew (inside the existing Crew store), Restoration Hardware and Steven Alan, all in East Hampton. There are also many seasonal shops, including pop-ups from both Sam Edelman and Stuart Weitzman, as well as Trina Turk and Lacoste. It’s TBD whether Lacoste’s new home will become a permanent fixture or just a summer shop, obviously we’re hoping for the former. Lacoste actually has a line of Hamptons Bags, below we show the Tote. MacKenzie-Childs has opened its new Southampton store, not far from Vineyard Vines. Also adding an East End outpost, The Black Dog, long a Princess favorite. In addition to all of the standard Black Dog fabulosity, the Southampton store will carry several lines specific to its locale, including Ella Vickers recycled sailcloth totes. This weekend and next week bring more openings, including a new Bond No. 9 store in Sag Harbor. It makes sense, considering the firm does market a ‘Hamptons’ fragrance, as well as a ‘Montauk’ scent. Regular readers know we have been loathe to spend much time looking at the fall fashion collections, let alone the resort/cruise lines that have been showing in New York the last two weeks. Spring has just been too slow in coming this year, and in many cases when it did arrive it came with deadly, destructive force, leaving us eager to simply revel in a few days of warm, sunny skies and gentle breezes. Contemplating a future need for heavier, warmer garments just hasn’t been on the radar. Until now. Today we make an exception, sharing a few pieces from the Yves Saint Laurent 2012 Resort collection. The entire line carried a strong nautical vibe (sometimes overly so) in seagoing colors and details, as well as bright florals reminiscent of island tides. Very bright, very fun, perfect for a beachy escape. Today’s final note consists of exciting news here at the Prepatorium, in the form of an announcement from our friends at Clairebella, they are officially Greek licensed! That means very shortly we’ll be offering Clairebella’s wonderful accessories personalized with your favorite Greek organization. May you enjoy a delicious weekend, marked by relaxation and good times. We start with news about a favored brand that is expanding their product offerings. Serious expansion. We’re talking about Jack Rogers, makers of the ubiquitous Navajo sandal seen below. Those paying close attention to that photo probably already noticed something else: the new Jack Rogers slim ballet flat. Below we see another version of their new flat. On a personal level this is splendid news. But from a business perspective we are reminded of many recent brand extensions that have not fared well, many with disastrous results. The failed Ruehl stores Abercrombie opened so quickly come to mind, as do the continuing rumors that Crocs, following explosive growth, could soon file bankruptcy. Even smaller efforts like the Oilily expansion into the US was not successful. However, there are several executives at Jack Rogers who possess solid resumes with experience at firms like Polo Ralph Lauren, Gap and Tory Burch. This leads us to hope that the broad brand extensions of the kind detailed above prove to be the exception, rather than the rule. When we see the word ‘jelly sandals’ included in the new product line we cringe more than just a little. Wondering where the new Jack Rogers stores might be going…? We know quite a few folks who will be pleased with this news. Are you excited by the news? And thoughts on Jack Rogers Jellies? We close with a fun tidbit we saw on British Vogue’s site, news that Christian Louboutin has teamed up with Ladurée, the famed French macaroon and pastry house. The luxury shoe designer has created special boxes for all those delicious goodies, they will be available in the UK this September, no word yet on the possibility of anyone on this side of the pond being able to purchase the designs. Happy-Happy almost-weekend everybody! Here at the Prepatorium we finally have something resembling normal temperatures: we might hit 75 degrees today. Calm yourselves, it has not yet happened, it is merely a prediction made by the Weatherologists on teewee, so there’s just an itty-bitty chance they could be wrong. Regular readers are aware we feel strongly about the virtues of basics upon which one can construct a meaningful existence: basic decency towards others, basic recipes, basic apparel and accessories. The movement is by Seiko, so this one isn’t just a pretty face. It is available now at the Bobby Jones Shop. We have several other opportunities for you to make contributions to the economy, all of them fiscally-friendly, of course. Bergdorf Goodman is having their Designer Sale with “Prices as much as 40% Off” on items like the D & G Pumps(L) and the Tory Burch Megan flat (R). Another emporium offering substantial savings: J. Press. Their Blue Silk Herringbone jacket is an excellent investment for the MOTH (Man of the House) in your life. Classic stalwart Banana Republic also has scads of goods with revised price points. Below, the Cotton V-Neck Sweater, now $39.99 for most colors, but only $24.99 in white. Not to be left out, Brooks Brothers is promoting some solid discounts on Men’s merchandise for Father’s Day. Our next company covered is assuredly not known for helping one save their pocket change; we quite respect that policy. We’re talking about Hermès. The luxury firm has opened a seasonal store in East Hampton. The shop is located right on Main, will be open until Sept. 20, and will carry some limited edition goods. 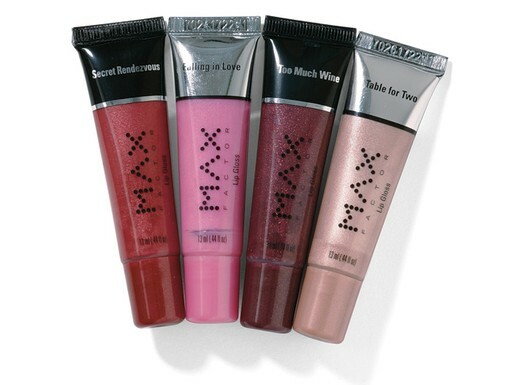 In another SOTT (Sign of The Times), word from P&G that Max Factor cosmetics will no longer be sold in the US. Because we adore The Queen (we more-than-adore our own TQM but today we speak of the one on the far side of the pond,), we thought we would close out the post with this photo, perfectly suited to be today’s Pretty in Pink. 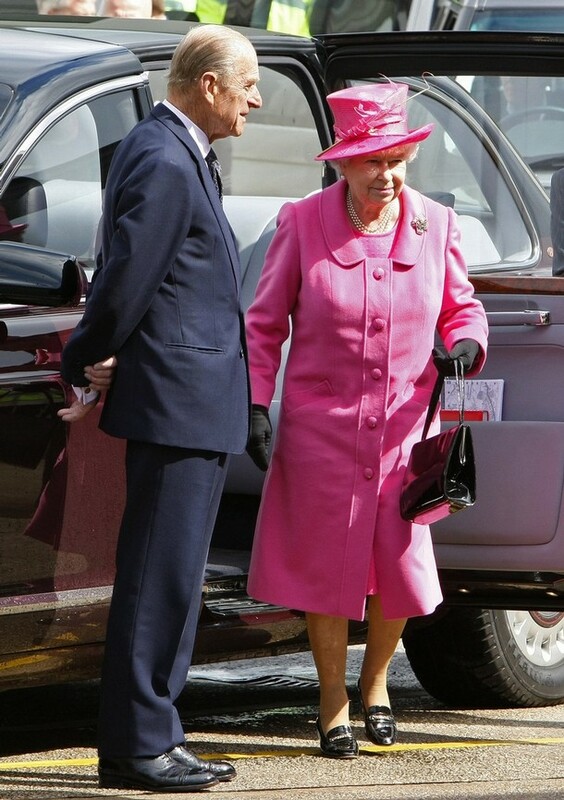 The picture of HRH and Prince Philip dates to late May, and we think she looks faboo. Enjoy the weekend, dollfaces, we’ll chat again soon! Hello-Hello! Is everyone enjoying their “It’s Almost Friday” Day? We start with a thank you to the always-elegant and fabulously witty Miss Pretty for nudging us about a story in the Times appropriately titled When No One Wants to Look Like a Banker. And what are they wearing instead? The slide show accompanying the story shares several looks. Below, the red silk knit tie is from Ralph Lauren and the Cotton Handkerchief is from Brooks Brothers. In the next photo the striped shirt is from Thomas Pink and the Alexander Olch linen bow tie is carried by Bergdorf Goodman. We cannot embrace the next look in its entirety, but if either of the madras pieces are appealing, they can both be found at Ralph Lauren. The shorts are available online at Colette, the French purveyor of cutting-edge fashion. This is the Junya Watanabe-designed cardigan Michelle Obama likes so much she has it in two colors. We love the look of these totes. I have been going to this Lilly Pulitzer warehouse sale for at least 5-6 years. My mother and I make it a “girls night” beacuse people start to line up as early as noon the day before!!! So if your going to go get there at least 12 hours before it starts and bring your airmattress from the “Great Lilly Camp Out”. They do allow everyone to sleep indoors and time to pack your car back up. We always have the best time hanging out with other lilly lovers : ). This sale is INTENSE. the prices are the best most amazing things around and if your lucky enough to fit into sample sizes (2 or 4 sometimes a 6) then you will be purchasing Lilly Dresses for $20. AMAZING! This a a sale that you HAVE HAVE HAVE to have a plan and a shopping buddy. When we get inside I go to samples and shoes and my mom hits up dresses and bathing suits- we get everything in size 2-6 then meet up 1 hr later in the dressing room area (yes area no individual rooms) and we go through our santa clause size saks and narrow it down to the best finds. Sometimes hanging out in the dressing room you will find the best sizes- as ladies are finished trying things on they hang them back up on a rack and that rack can be GOLD if you monitor it. After the dressing room we always go out for another round to see what we missed. There is no cell phone service at the sale (it is in a basement ballroom). I am from the area but recently moved to Nashville, TN and I will be flying up for this. Once you shop this sale you will NEVER be able to purchase her regular priced clothing…. These sound like super suggestions – thank you Caroline! Turning a page on the calendar here at the Prepatorium is always a pleasure this time of year, and today does not disappoint. In keeping with the bright sunshine outside we wanted to share a few updates to some of our favorite collections at the shop. We start with additions to our Lilly Pulitzer Stationery & Gifts group. The Stickers & Labels Set matches our springtime mood perfectly! The set includes 20 sheets of classic Lilly designs, and at only $14 they have turned out to be an excellent little gift. Another perfect present for someone special, the Circle Notes in Mumsie and Animal Crackers. We like the way they are finished off with the perky little grosgrain bows in matching shades of pink. Preppy-style retailer J. Crew must be on Cloud 9 today with news of Michelle Obama’s wardrobe choices for her first public appearance in London. The First Lady selected Crew’s Dazzling Dots pencil skirt ($158) and the Crystal Constellation Cardigan ($298). But if you are now making plans for adding the cardigan to your walk-in (it really is a delightful choice for an evening out), we bring you not-such-wonderful news: according to the J. Crew site, the sweater is sold out. Yesterday Mrs. Obama wore a custom-made Thakoon coat with grosgrain piping when boarding Air Force One. Upon arriving in London the First Lady was in a Jason Wu chartreuse silk crepe short sleeve sheath accented by a shawl collar. The young designer tells WWD he had no idea Mrs. Obama would be wearing another one of his creations. We couldn’t be happier to see the First Lady in American designers again; we eagerly await news of her attire for her meeting with the Queen! One note before we leave this topic: J. Crew is doing another Final Sale promotion, with an additional 30% Off sale prices. Another word of caution however, this offer is not good at retail or factory stores, and it ends tomorrow (April 2) at midnight. To receive the discount, use promo code EXTRA30 at checkout. Also today, news that Tommy Hilfiger has opened his new store in East Hampton, right on Main Street. Mr. Hilfiger has only 9 other free-standing shops; this is his first in the Hamptons. In early March the company held its menswear presentation, announcing an expansion of their tailored clothing offerings. Mr. Hilfiger can be seen in the photo, standing in the center, wearing an orange necktie. …using one of our new Ribbon Key Fobs. You select the ribbon of your choice, as well as the webbing. And to be perfectly crass (again, really, how tasteless can we be?) in discussing prices, let’s just worsen the situation, shall we? These fun and fabulous goodies are a mere $5, offering the perfect pick-me-up gift for just about anyone on your list. To be completely candid dolls, this is one of those times when we are grateful Great Aunt Molly departed this planet long before seeing us engaged in discussing something as inappropriate as this. Frankly, the poor woman would be horrified; but then, having a career in tv for all those years didn’t exactly conform to family standards either. Finally today, a peek at the new Britney Spears marketing poster for her Candie’s Only line at Kohl’s. The collection debuts in April. US Weekly will distribute 4 million copies of this poster in their April 15 issue. Previous “Candie’s Girls” include Avril Lavigne and Hayden Panettiere. We must apologize, as yesterday we promised photos from the Kate Spade fall collection, and we have just run out of space and time. Tomorrow, we promise-promise-promise!